Make sure you have a read through our ultimate guide to planning and designing a kitchen too, any more questions you have will for sure be answered over there. 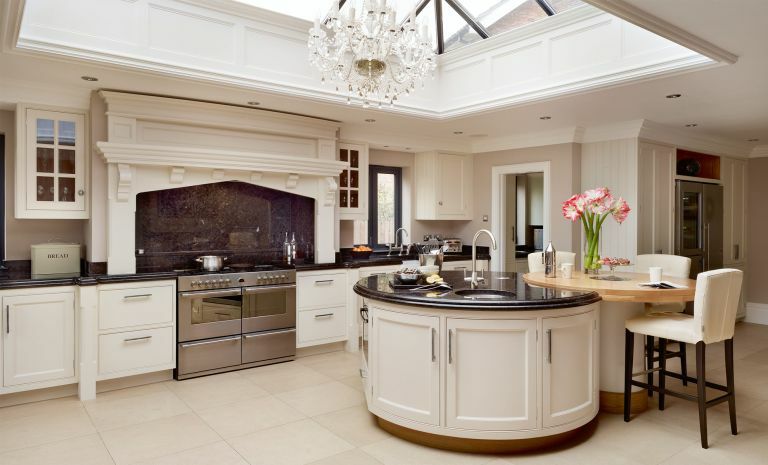 What are the benefits of a curved kitchen? Curved kitchens' soft lines work well in family homes, where they reduce the risk that hard edges pose to children. Curves are also ideal for small, awkward kitchens, where protruding corners can place restrictions on movement, and will open up the room and create the illusion of space. If you are working with a small kitchen, make sure you go and have a read through our guide to designing a small kitchen too, there are plenty more tips there. Until recently, the idea of curves in the kitchen was the preserve of contemporary homes, but there is now a wide choice for period properties, ranging from relaxed country styles to grand classical designs. Both built-in and freestanding cabinets are widely available, from bespoke handmade kitchen manufacturers and high street suppliers. See more handmade kitchen design ideas to inspire your scheme. Curves are particularly well suited to kitchen diners, with perhaps a rounded breakfast bar forming an attractive focal point in an open plan area. The kitchen’s soft appearance will create a relaxed feel, helping it to blend in with other ‘zones’ and inviting families to spend time there together. We have loads more advice on open-plan kitchens over in our guide. Kitchen island units with curves bring real wow factor to the kitchen; in its simplest form the island may be rectangular with rounded edges to subtly soften the overall appearance, or it may be fully circular. The most impressive islands form a semicircular work space around the cook, with perhaps a hob at the centre and preparation space on either side. Other ways to use curves include protruding cabinets beneath pantry cupboards, and around hob and sink areas. They are also a good idea near doorways, to make a smoother entrance. Are curved kitchen units more expensive? The downside of curves is that they cost more than standard units – up to twice as much, due to the extra craftsmanship involved in their manufacture. But they can be more subtly incorporated at a lesser cost, with perhaps just the end of a built-in run being curved, a corner dresser, or if space allows a kitchen island, which works well with straight edges elsewhere in the kitchen. Do curves reduce kitchen storage space? It is a common misconception that curved units compromise on internal kitchen storage – bespoke manufacturers work hard to ensure every inch can be utilised, and good kitchen planners can create a scheme that contains even more storage than a traditional design. Your possessions will, however, fit in differently than before, such as chopping may be too modern, but a simple Shaker-style kitchen is ideal for period homes. Cabinet door furniture should also be smooth — consider round knobs, curved bar or cup handles or doors with handle grooves designed in. Worktops will need to be custom cut, usually in solid timber, granite or a composite, and this can add significantly to the cost. You can find out what material is best for your style and budget in our guide to choosing kitchen worktops. Don’t forget to include curves in other elements, such as sinks, taps and rounded appliances, to complete the look.